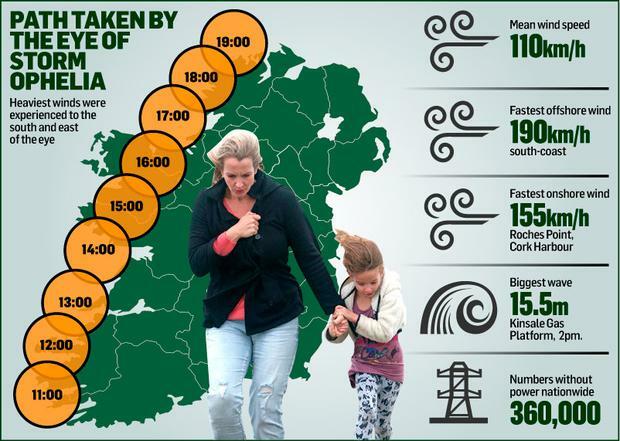 Hundreds of Defence Forces members will be sent to the worst-hit part of the country today as the Government begins assessing the cost of the damage. It will be several days before local authorities can establish the cost of repairs, but it is expected to run into hundreds of millions of euro. However OPW Minister Kevin 'Boxer' Moran told the Irish Independent money would not be an issue. "Money is not the problem. The Government won't be found wanting when it comes to money. We've a good record where we've had issues," he said. He said lessons would be learned from the preparation for yesterday's events, including a need to increase public awareness of the meaning behind different colour weather alerts. However, he said the Government and National Emergency Co-ordination Group had not over-hyped the threat posed by the strong winds. "There's an element of people saying we overreacted but three lives were lost and it could be more. I can't emphasise this enough, we didn't overreact," he said. "There are an awful lot of people alive today because of what we did." The Cabinet meets in Dublin this morning, where a number of ministers will brief colleagues on the response efforts. Defence Minister Paul Kehoe told the Irish Independent that members of the Army were strategically placed at locations around the country yesterday and would be on the ground from early today. Yesterday soldiers cleared roads around Kenmare, Co Kerry, while military vehicles were used to ferry HSE staff to and from their offices in Callan and Graiguenamanagh, Co Kilkenny. Members of the Defence Forces have been called back from training courses and a pre-deployment training event scheduled for today for officers heading on a six-month tour of duty in South Lebanon has been cancelled. "We will have to prioritise work that will have to be done," Mr Kehoe said, adding that members of the voluntary Civil Defence would also be on the ground. He noted that every barracks has a civil aid unit with the ability to clear roads and help the ESB in accessing sites. The Air Corps may also be called upon to help provide aerial imagery of the damage. Environment Minister Denis Naughten will visit the ESB's central control office at 6.30am in order to bring a report straight to Cabinet afterwards. Around one-in-five homes across the country was left without power, and it will be more than a week before power is fully restored. 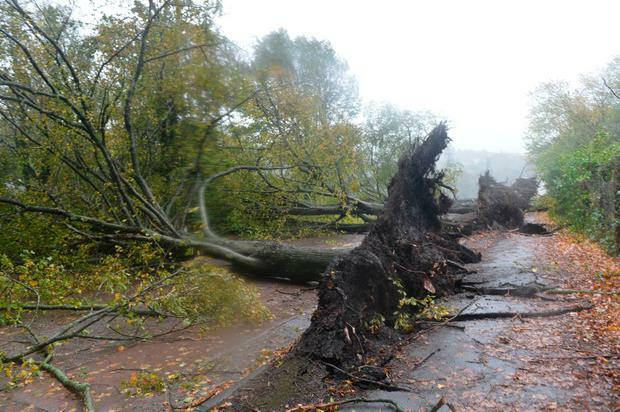 The ESB expects to restore power to between 70,000 and 80,000 homes a day. Transport Minister Shane Ross is expected to give an early assessment of the damage to the road network. He said the response to the storm would be "top of the agenda" and the Government "wasn't found wanting for money" after the recent floods in Donegal. "The Government will address the issue of funding head-on and won't run away from it in any way," he said. Taoiseach Leo Varadkar thanked ESB crews, local authority workers and gardaí who worked through the storm.